In a charged essay recently published in the Los Angeles Review of Books, Daniel Allington, Sarah Brouillette, and David Golumbia offer a sharp corrective to the utopian claims that have so often been used to describe the digital humanities. Noting the overlap with Silicon Valley’s rhetoric about “disruption,” they contend that digital humanities is about “the promotion of project-based learning and lab-based research over reading and writing, the rebranding of insecure campus employment as an empowering “alt-ac” career choice, and the redefinition of technical expertise as a form (indeed, the superior form) of humanist knowledge.” This new field, they conclude, aligns too neatly with a neoliberal view of a higher education that uses the digital to hollow out the core critical, intellectual, social, and even professional practices of the humanities. This contentious argument is often compelling but also limited since, like much of the commentary on digital humanities, it gets locked into a set of binaries that pit big data against the lonesome text, the global digital archive against the specialized library, and distant reading against close textual analysis. Like Allington et al, we too are concerned that the first term in the phrase digital humanities threatens to overwhelm—rather than simply modify—the second term. When this happens, intricate works of culture can dissolve into abstract data sets. This is not, however, an either-or choice, and digital humanities might work best when the two terms remain in productive tension with one another. We call this the domain of medium data and, using the Modernist Journals Project as a case study, we will explore the ways it helped reshape modernist studies by navigating the complicated and still emergent spaces between the digital and the human. The Modernist Journals Project began in 1996, when a graduate student uncertainly placed a few magazine pages on an agonizingly slow flatbed scanner in a tiny office that doubled as a storage closet. Like the editors of the little magazines the MJP has since digitized, we had only a vague idea of what we were doing, though we did sense that something was changing in the way we thought and taught about the early twentieth century. At this time, after all, what we now call the new modernist studies was just beginning to take shape. Two years earlier, a journal called Modernism/modernity had been founded, though the Modernist Studies Association was still two years distant on the horizon. There are many reasons why scholars abruptly began to return to and then rethink the idea of modernism—but at least two of them could be glimpsed on that flatbed scanner manned by a dubious intern who was nevertheless grateful for a small research stipend. First, and most obviously, the technologies of scholarship had begun the fundamental transformation now imperfectly captured by the catch-all term “digital humanities.” In 1993, the Mosaic web browser appeared, followed shortly by Netscape 1.0, and together, they made accessible a vast array of digital assets. At work in that broom closet, we initially aimed to add a bit of new material to this burgeoning digital archive by creating a very small data project: a web page on The New Age featuring a handful of interesting articles. In fact, Robert Scholes, Mark Gaipa, and Sean Latham were drawn not to the magazine in its entirety, but only to a handful of fascinating articles by Havelock Ellis that appeared in its pages. We sought first simply to scan these items and perhaps add them to the Modernism Index—an early (and, in retrospect, ludicrously optimistic) attempt to provide an annotated listing of every item on the web related to modernism. As the work began, however, we quickly realized that Ellis’s writings formed part of a rich network radiating out from these individual issues and across the many volumes of this almost entirely forgotten weekly. We recognized some names—Ezra Pound (and his various aliases), H. G. Wells, and T. E. Hulme—but we were startled to find even better stuff penned by then essentially unknown writers like Beatrice Hastings, Florence Farr, Marmaduke Pickthall, and the editor, A. R. Orage. We could understand the value of such writing thanks to the second set of changes that helped produce the new modernist studies: the critical and intellectual reaction against a postmodernism that had too hastily reduced the first half of the twentieth century to an encrusted set of canonical writers. In their often-cited 2008 PMLA article, Douglas Mao and Rebecca L. Walkowitz called this movement the start of an “expansive tendency” that helped reshape nearly every literary-historical period. For those working in the twentieth century, such an expansion became (and remains) something like an avalanche. This era, after all, saw the rise of mass literacy and the consequent invention of mass media, first in the magazines and then in new electronic technologies including film, radio, phonography, and later television. In addition, a “spatial broadening . . . meant not only that scholars now attend to works produced in, say, Asia and Australia but also that they investigate complex intellectual and economic transactions among, for example, Europe, Africa, the United States, and the Caribbean” (Mao and Walkowitz, “New Modernist Studies,” 738). Such networks primarily took shape in and through periodicals—not just the famous “little magazines,” but also venues like Scribner’s, The Crisis, The New Freewoman, The Chicago Defender, and the pulps. Long dismissed as quietly rotting containers for a few precursor texts, magazines increasingly became visible and legible as part of a radically expansive and expanding modernism. The Modernist Journals Project thus arose at this generative nexus of technologies, ideas, and archives. When work began in 1996, however, we glimpsed no such lofty horizons—and not just because that tiny office lacked a window. We did realize, however, that Ellis’s writing was not even close to the most interesting thing in The New Age. Specifically, the critical arguments then just taking shape about modernism could be glimpsed in the pages of this often-wild weekly that refused to separate art, economics, and politics. Long before the new modernist studies, in other words, The New Age had already seen modernism as a site of expansion, and it courted debate, controversy, and even snark in ways that surprised us. It soon became apparent, for example, that Beatrice Hastings was every bit Pound’s equal in a debate; indeed, her talents exceeded those of nearly everyone at the magazine, which might be why she started penning pseudonymous letters and columns against which she could then argue. Yet Hastings had been essentially forgotten when we started our work and the only documents we could find about her included some passages from Modigliani (she had modeled for him) and her short autobiography, The Old “New Age”: Orage–and Others. Although the magazine had originally been founded with help from G. B. Shaw as a Fabian organ, Orage and his brash cohort of graduates from teacher colleges, extension schools, and red brick universities quickly wrested control of the venture. They seemed as impatient with the idea of a canon or tradition as were the newly emergent modernist scholars of the 1990s. And, just as we found ourselves playing around with a scanner and HTML, they too were experimenting with new technologies that made it cheaper and easier than ever before to disseminate linked information to a global audience. The convergence of digital technology, new ideas about modernity, and this noteworthy periodical from the first decades of the twentieth century essentially brought the MJP into existence. Initially, however, our aims were limited: to create a digital edition of The New Age under Orage’s editorship and to provide some basic tools that would make it useful to scholars and students alike. We were far removed from anything like what we now call “big data,” though at the time, scanning thousands of magazine pages seemed like a very big job indeed. Our motto was and remains “make it useful.” And we quickly realized that to be useful, the project needed, first, to shift its scale and, second, to see the magazines as a kind of data that could be linked to other data. Initially, these links were largely internal, on the one hand connecting issues, series, and authors, and on the other hand presenting a growing array of critical material including images, biographies, introductions, and contextual essays. As the project expanded in the late 1990s, however, the links began to grow to include name-authority records in the Library of Congress and genre headings devised by Getty. When we finished work on The New Age in 2003, we had essentially created a digital hybrid akin to other nascent but more readily visible digital humanities projects like the Rossetti Archive. It still looked and felt a lot like a critical edition, but the PDF files that most users accessed rested on a new slew of TEI files and Metadata Encoding and Transmission Standard (METS) catalog records that had essentially converted the magazine into a rudimentary database of contributors, texts, and images. To work so intimately with the run of a magazine is to see each issue, volume, and even the full run itself as a single node in an expansive network. The New Age regularly advertised other periodicals; it ran columns that commented on or critiqued other magazines; it featured a long-running series by Ezra Pound who believed that such publications offered sociological insights into the radical diversification of the reading public; and its authors themselves published and often referenced the work they had done in other periodicals. Seeing all these different periodicals visibly intersect, we faced the radical expansiveness of a modernism that reached out well beyond The New Age and realized that to publish even a full run of the journal would be to rip it apart from the rich cultural contexts that made it meaningful. At this point, as the directors, editors, and staffers began to include other kinds of periodicals from the era, the MJP began to become a “medium data” project. Candidate magazines were chosen carefully, and a great deal of time and energy went into finding complete runs that had not been mutilated by well-meaning archivists who, as a matter of practice, removed and disposed of the covers and advertisements before binding the volumes. In addition, the Sonny Bono Copyright Term Extension Act required that we focus only on magazines published before 1923 since most of the material after that date did not fall in the public domain. Although the term digital humanities had not yet been coined, a kind of gold rush had begun as scholars, archivists, and entrepreneurs began to scan and digitize vast amounts of data. Amid this flurry, however, the MJP remained (indeed, remains) cautious, still seeing itself as a boutique operation hovering somewhere between the “small data” of an individual edition and the big data of something like the HathiTrust. Fig.1. 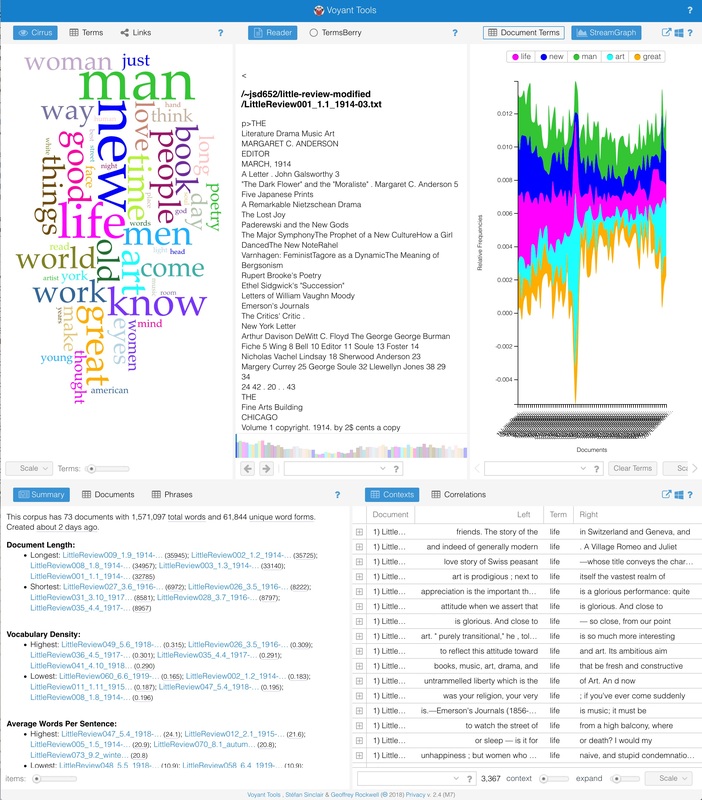 Voyant Tools interface for the MJP’s corpus of The Little Review, showing the possibilities for medium data analysis. MJP’s instantiation as a medium data corpus facilitates two kinds of knowing—close reading and digital analysis—that coexist in a productive tension rather than the false binary of traditional scholarship vs. big data. It is the encoding of these texts in accordance with TEI and METS standards that envelops the content in a machine-searchable and -indexical archive, thus revealing the “complex intellectual and economic transactions” that put these magazines in contact—and conflict—with one another (Mao and Walkowitz, “New Modernist Studies, 738). In this regard, familiar automated searches by metadata such as author, genre, or text can enhance and expedite a traditional close-reading process by highlighting the dense entanglements of the era’s cultural field. Thus, the value of MJP’s medium data approach lies in its network of texts that are related to each other historically and bibliographically, and which can always be located and examined individually. It is the ability to toggle between a bird’s-eye and closeup view that sets the MJP apart from the big data approach used by many digital humanities projects today, in which it is not possible to access individual texts for close reading. These networks are not treated as a monolithic entity but as a set of intersecting yet distinct aesthetic practices spread unevenly around a heterogeneous set of actors. In other words, it works precisely because all of the publications inside this medium data field are related to each other in an example of what Carole Palmer has called thematic research collections, “digital aggregations of primary sources and related materials that support research on a theme.” Palmer notes that early digital archivists “recognized that information technologies open up new possibilities for re-creating the basic resources of research and that computing tools can advance and transform work with those resources.” And there we have the kernel of what MJP was destined to become. While the project has been central to a parade of publications pertaining to the new modernist studies, a growing list of born-digital projects demonstrates how newer technologies of scholarship transform the very nature of this work and thus reshape what modernism might mean. For that reason, the second term of medium data means that alternative modes of inquiry materialize when we lift the data out of the MJP itself. Researchers may download TEI-encoded XML transcripts and metadata directly from the MJP Lab section of the website to create custom analysis projects. Contemporary data-driven practices like text mining, topic modeling, network analysis, and GIS mapping offer a fulfillment of what we only dimly saw during the first digitization of The New Age. For instance, in a special issue of the Journal of Modern Periodical Studies on visualizing networks, J. Stephen Murphy and Mark Gaipa contend that “magazines should be understood . . . as recommendation systems that operate through networked structures,” and they use plain-text and metadata analysis to argue that “the review and author co-appearance networks in little magazines contributed to the formation of modernist taste . . . and additionally facilitated the emergence of modernism as a literary movement.” In the same issue, Gabriel Hankins transforms information from a variety of textual sources into GIS data to map the emergence of global modernisms through time and space, suggesting specific ways in which MJP could drive Neatline and a map layer provided by the OpenStreetMaps consortium. Clifford Wulfman notes that “word maps and plotted graphs . . . are not “data” but readings, interpretations of data mediated by programmed algorithms and hermeneutic desires,” duly cautioning us to forge digital humanities into a discipline that critiques its own methods. His own Blue Mountain Project demonstrates how older metadata models like that of MJP can be expanded through open linked data for a more capacious view of modernist periodicals and the classes of their contents. Thus, the medium data nature of MJP allows us to synthesize interpretive and quantitative reading methods, developing a dynamic view of the institutional and political networks in which modernists organized themselves and debated the idea of modernism as it was emerging. The present moment of digital humanities bears an analogic relationship with the technological revolution that fueled modernism, since new print technologies and dissemination platforms of the early twentieth century mirror the proliferation of computational tools and methods in our own time. Indeed, the Modernist Journals Project took shape amid some of the same tensions, anxieties, and opportunities that defined the very objects it gathers and describes. Like the magazines it archives, and like the new modernist studies, the MJP combines a wide array of identity politics and technological advances into a medium-sized platform. Since it emerged during a moment of cataloging, indexing, and archiving when we modernism was once again being hotly contested, it embodies scholarly concerns by facilitating ideological—and now technological—criticism without narrowing the material down to a canon. Modernism itself has always been a fluid, uncertain concept—an attempt to carve out some manageable bit of humanistic data from the eruption of mass culture in the early twentieth century. The medium data approach we’ve briefly outlined in this essay enables us to embrace such uncertainty while exploring the charged yet fungible boundary between the machine and the human—between the sprawling networks of a still-unfolding modernity and the keenly felt need for human particularity. Daniel Allington, Sarah Brouillette, and David Golumbia, “Neoliberal Tools (and Archives): A Political History of Digital Humanities,” Los Angeles Review of Books, May 1, 2016. Modernism/modernity was founded by Lawrence Rainey (then at Yale) and Robert von Hallberg (at the University of Chicago) and sought to recast modernism as something more than a “repertory of artistic styles . . . or set of ideas” (Rainey and von Hallberg, “Editorial/Introduction,” Modernism/modernity 1, no. 1 (1994): 1). Crucially, both founding editors had a deep interest in print culture and magazines. Rainey had just published Institutions of Modernism, which explores the networks, publishers, and economic structures that enabled modernist experimentation rather than looking closely at individual texts. Von Hallberg, on the other hand, was directing an impressive cadre of graduate students (Mark Morrisson, Lee Garver, Jessica Burstein, and others) to periodicals and, in particular, to The New Age. Douglas Mao and Rebecca Walkowitz, “The New Modernist Studies,” PMLA 123, no. 3 (2008): 737–48, 737. In 2004, Stephen Gray published the first biography of this remarkable figure, Beatrice Hastings–A Literary Life (London: Viking, 2004) and a new array of work has subsequently begun to appear, including Benjamin Johnson and Erika Jo Brown, eds., Beatrice Hastings: On the Life & Work of a Lost Modern Master (Warrensburg, MO: Pleiades, 2016). See also Ann Ardis, “The Dialogics of Modernism(s) in the New Age,” Modernism/modernity 14, no. 3 (2007): 407–34, and “Debating Feminism, Modernism, and Socialism: Beatrice Hastings’s Voices in The New Age,” in Gender in Modernism: New Geographies, Complex Intersections, ed. Bonnie Kime Scott (Champaign: University of Illinois Press, 2007): 160–85. For many years, the capsule biographies of artists and selected images of their works that appeared on our site vied with the individual issues themselves for being most widely searched and used. We had, in other words, accidentally created a database of early-century artworks reviewed in The New Age that proved as useful as the magazine itself. TEI is shorthand for the Text Encoding Initiative, an XML-based set of open-source standards that allows editors to embed semantic and interpretive elements within a digital text. METS describes a standard maintained by the Library of Congress and used by catalog systems to make digital texts readily discoverable across library systems. Used together, these two standards essentially make it possible for computer systems to recognize, catalog, transform, and render digital texts within web browsers and other user-facing environments. Pound’s series, “Studies in Contemporary Mentality,” ran from August 1917 to January 1918. It has been reproduced in Robert Scholes and Clifford Wulfman, Modernism in the Magazines: An Introduction (New Haven, CT: Yale University Press, 2010), 221–326. See Sean Latham and Robert Scholes, “The Rise of Periodical Studies,” PMLA 121, no. 2 (2006): 517–31. Carole L. Palmer, “Thematic Research Collections,” in A Companion to Digital Humanities, ed. Susan Schreibman, Ray Siemens, and John Unsworth (Oxford: Blackwell, 2004). J. Stephen Murphy and Mark Gaipa, “You Might Also Like . . . : Magazine Networks and Modernist Tastemaking in the Dora Marsden Magazines,” Journal of Modern Periodical Studies 5, no. 1 (2014): 27–68, 30. Gabriel Anderson Hankins, “Visualizing Modernist Magazines with Geographic Information Systems (GIS): New Approaches in the Spatial Humanities,” Journal of Modern Periodical Studies 5, no. 1 (2014): 69–93, 85. Clifford E. Wulfman, “The Plot of the Plot: Graphs and Visualizations,” Journal of Modern Periodical Studies 5, no. 1 (2014): 94–109, 107–08. We deliberately invoke “interpretative” here, rather than the “qualitative” that may seem like a more intuitive companion for “quantitative.” Although scholarship in the digital humanities often frames the incorporation of data into literary criticism by invoking a distinction between qualitative and quantitative analysis, we prefer “interpretative” to indicate that we are drawing explicitly from literary-critical frameworks, which emphasize interpretation—and therefore, in addition, the intellectual history of hermeneutics that informs literary criticism.